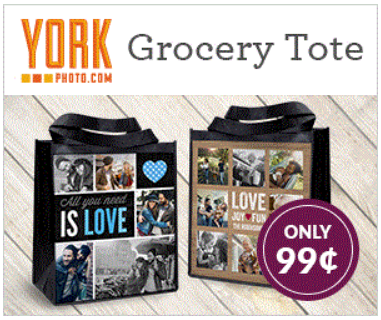 New and existing York Photo customers you can order a Reusable Shopping Bag, for $0.99 + S&H. Use promo code: SHOPBAG at checkout. Shipping and handling: starts at $3.99. Order quantity limited to one. Ordered Online. One time use. Cannot combine coupon codes. Offer open to new customers only. Offer expires April 21st, 2019.